Our old chambers had been left unchanged through the supervision of Mycroft Holmes and the immediate care of Mrs. Hudson. As I entered I saw, it is true, an unwonted tidiness, but the old landmarks were all in their place. There were the chemical corner and the acid-stained, deal-topped table. There upon a shelf was the row of formidable scrap-books and books of reference which many of our fellow-citizens would have been so glad to burn. The diagrams, the violin-case, and the pipe-rack — even the Persian slipper which contained the tobacco — all met my eyes as I glanced round me. There were two occupants of the room — one, Mrs. Hudson, who beamed upon us both as we entered — the other, the strange dummy which had played so important a part in the evening’s adventures. It was a waxcoloured model of my friend, so admirably done that it was a perfect facsimile. It stood on a small pedestal table with an old dressing-gown of Holmes’s so draped round it that the illusion from the street was absolutely perfect. “I hope you observed all precautions, Mrs. Hudson?” said Holmes. He had thrown off the seedy frockcoat, and now he was the Holmes of old in the mouse-coloured dressing-gown which he took from his effigy. “The old shikari’s nerves have not lost their steadiness, nor his eyes their keenness,” said he, with a laugh, as he inspected the shattered forehead of his bust. He turned over the pages lazily, leaning back in his chair and blowing great clouds from his cigar. Three Months in the Jungle (1884). Address: Conduit Street. “Well, I don’t insist upon it. Whatever the cause, Colonel Moran began to go wrong. Without any open scandal, he still made India too hot to hold him. He retired, came to London, and again acquired an evil name. 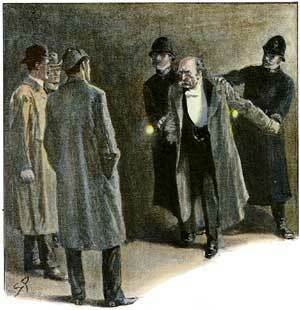 It was at this time that he was sought out by Professor Moriarty, to whom for a time he was chief of the staff. Moriarty supplied him liberally with money, and used him only in one or two very high-class jobs, which no ordinary criminal could have undertaken. You may have some recollection of the death of Mrs. Stewart, of Lauder, in 1887. Not? Well, I am sure Moran was at the bottom of it, but nothing could be proved. So cleverly was the colonel concealed that, even when the Moriarty gang was broken up, we could not incriminate him; You remember at that date, when I called upon you in your rooms, how I put up the shuners for fear of air-guns? No doubt you thought me fanciful. I knew exactly what I was doing, for I knew of the existence of this remarkable gun, and I knew also that one of the best shots in the world would be behind it. When we were in Switzerland he followed us with Moriarty, and it was undoubtedly he who gave me that evil five minutes on the Reichenbach ledge.